For the past 24 years, Talkingink has turned screen printing into a science. A science from which our customers benefit greatly. You can order custom t-shirts with the highest level of quality and professionalism at a price that blows all internet t-shirt companies out of the water. That’ right, we beat customink t-shirt prices significantly. What’s more is that we have a higher level of quality control and faster turn around times on orders than other internet based custom t-shirt companies. How you may ask? Again, we have been screen printing for 24 years and we have experienced every kind of graphic, cause, purpose, and deadline that there is with custom t-shirts. We have turned our business into a science that operates like clockwork. Utilizing the best equipment with the best inks on the market and we output a product that is superior. All of our screen printing on custom t-shirts is done in-house by dedicated printers who love their jobs. They enjoy printing your shirts and seeing the end result of an actual shirt from their first glimpse at the job in the art department. 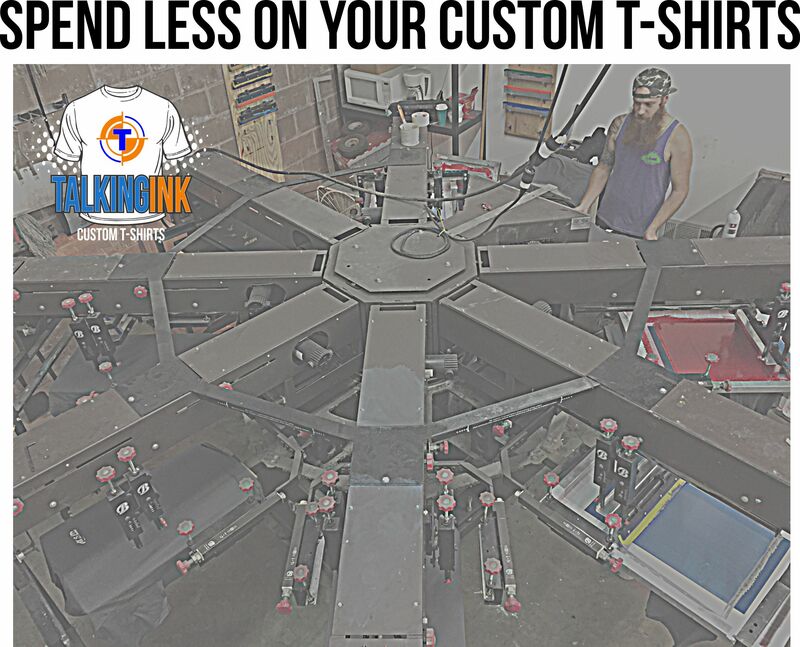 With Talkingink you spend less on your custom t-shirts because we print every customers shirt ourselves. We do not send your order elsewhere to be printed. This saves you time and money. When you order your custom t-shirts from the big online websites, they send your job somewhere else in the country to be printed. So more hands are involved in your order and each hand gets a piece of the pie. So as the customer you are left paying more and waiting longer than you need to. Would you go to a bakery to order a cake if you knew the baker actually sent your cake somewhere else to be baked? Of course not because you know that you’d be paying more and it’d take longer to get the cake. And if you have a problem…who do you go to? The baker didn’t bake the cake, someone else who you don’t even know baked your cake. Large online custom t-shirt companies operate the same way. People go that route because they don’t know other avenues exist. They do and they are superior, local, and of better quality. Spend less on your custom t-shirts because you can.